Local (SVG) turtle monitoring groups attends training by Ocean Spirits in neighbouring Grenada. Volunteers from Sandy Bay ( Jeff Lavia, Leoroy Ballantyne and Valran Jones) Colonarie ( Rolstand Pope) and Sans Souci (Maria Baptiste) recently attended a training session by Ocean Spirits in neighbouring Grenada. 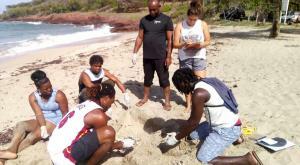 This initiative is part of the National Parks/ Fisheries Division National Sea Turtle Conservation Action Plan which seeks to train and mobilise turtle monitoring groups in coastal communities throughout St. Vincent and the Grenadines.While the focus was initially on the beaches of the Windward coast, community groups are now being formed on the Leeward Coast also. Individuals interested in volunteering to partake in community turtle conservation groups at a beach near you contact National Parks Authority at 453 1623.